Comparing Concrete Pavement to Asphalt? 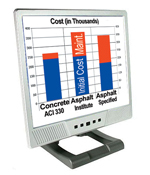 The fast, accurate and professional pavement comparison software tool. NRMCA’s Concrete Pavement Analyst (CPA) is powerful parking area design and costing software that quickly and accurately quantifies the differences between concrete and asphalt pavements. Using American Concrete Institute and Asphalt Institute recommendations, CPA compares total ownership costs, giving you the information you need to make sound pavement selection decisions. To request a free project review with a qualified CPA professional, please consult the list below. (If no professional is listed for your area, please send your request to NRMCA who will forward as appropriate). Let us know you are interested in a CPA presentation and how to contact you. It would also be helpful for you to tell us something about the project you are considering. NRMCA and all our project assistance partners are non-profit service organizations that do not charge a fee for project assistance. We are not sales organizations—our mission is to provide up-to-date construction information to help customers make informed decisions. of Marketing, at 240-485-1140 or by email at gochsenreiter@nrmca.org.